Are Fat Kids Doing Worse In School? Angela Meadows wrote a piece for The Conversation called “Why do heavier children do worse at school? It’s not their fault.” The piece takes a critical look at the research that suggests that larger students fare worse in schools, and the oft-drawn conclusion that if it’s true it must be directly attributable to the student’s fat. I’ll let the article stand on its own. What I want to talk about are the comments and the ridiculous lengths that people will go to in order to defend the idea that if research says that a negative outcome is more common in fat people, then it must be caused by our fat. I wrote recently about the things the people often overlook, often with disastrous consequences, in research like this. But this isn’t about people overlooking it, this is about people sticking their fingers in their ears, yelling LALALALALA and ignoring it on purpose. Maybe it is that fatter children and students don’t do things in an energetic manner. Might it not be simply that students who are heavier exercise less and so deprive their bodies and their brains of the many benefits which physical activity is know to bring? all teachers know healthier, fitter children tend to achieve more – those who carry too much weight are more lethargic and are slower to respond. I think that the third one is illustrative of the problem with the first two “All teachers know [insert stereotype about fat students]” First of all, any time we are saying “Everyone knows” and following it up with a stereotype about a group of people we’re headed down a bad path. When we are talking about fat kids, we are talking about a group of people who can face tremendous and ceaseless stigma and shaming – bullying from classmates, bigotry of students, teachers who look at them and “know” they will be “are more lethargic and are slower to respond,” gym teachers who “know” that they are un-athletic and disinterested in sports – who purposefully or accidentally kill any interest fat students have in movement or sports, coaches who assume fat kids aren’t athletic and so fail to give them the attention thin kids get, a world that tells them every day in so many ways that their bodies are wrong and bad, that they should be ashamed of themselves, that they deserve the poor treatment that they get because they aren’t thin, and that the only solution for the oppression is to fight their own bodies, while bowing and scraping to thank their oppressors. So even if those three comments were true, the root cause could still very well be the stereotyping, shaming, stigmatizing, bullying, and oppression that those kids face. All things that we could stop immediately with absolutely no negative effects. And since people’s efforts to make kids thin is ending in kids with higher weights and higher rates of eating disorders (and since there’s no non-stigmatizing way to say “I’m working so that in a generation nobody who looks like you exists”) it seems like society might have to trade in the cheap high of “fighting childhood obesity” if we ever want to do something that has a chance of actually helping kids be happier or healthier. So we might all want to start a war on the poor treatment of fat kids, rather than continue to fight a war against them. I was lucky enough to enjoy an education in a well-rounded and humane Primary School. Sure I was fat (and had Primary Lymphoedema it transpires), but I enjoyed sports and was ENCOURAGED. I stupidly thought that my talent and enthusiasm might be rewarded with the same sort of encouragement when I progressed to Secondary School at age 11. When I turned up to try out for the hockey team the P.E. teacher actually laughed in my face in front of everyone! That really set the tone of my sports and exercise experiences for the next 5 years. That teacher ridiculed me at every turn culminating in her standing on my back and forcing me to perform a press-up whilst telling the class that ;this is what a beached whale looks like’. Would anyone care to analyse my sporting underachievements?! Bloody hell, did the commenters even read the article? This wasn’t about fat kids actually performing poorer in schools, but fat children performing the same as thin children routinely being *graded* poorer by teachers for the same work! There is no way to interpret that but pervasive teacher bias… unless you just skip the content and make up your own version of what it said that gels better with your worldview. That’s what happens when adults feel justified in thinking of a toddling li’l moppet with a head full of My Little Pony as an adult subhuman enemy they must get before it gets them. I used to be a fat kid, who was among the most intelligent children in my class. 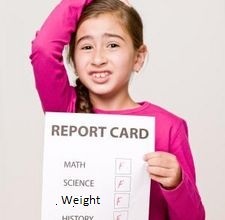 I purposely made mistakes on tests in order to avoid being called “the fat nerd” by my classmates. Now I’m a teacher and I take extra care to treat all kids equally, no matter their body size. I was the fat child. Yes I did worse then my peers, I also didn’t know until I was 13 (grade 7) that I am dyslexic. That was my problem, and teachers didn’t and in a lot of cases still don’t know how to teach dyslexic students.. Either kids are getting unfair grades or have a learning disorder it never should be judged on body type. Ps. I was the only one in two of my classes to get 100% on two assignments that all the other kids in my classes failed. The same sorts of comments show up every time there’s a study released that shows overwhelming bias based on gender, age, race, etc., too. People don’t give up their prejudices just because they’re given factual evidence of them. Unfortunately, those of us facing said prejudices every day don’t get to ignore them. Great. So, the solution to fat kids doing poorly because they are treated poorly is for them to lose weight so people will stop treating them poorly?!?! One of my most fervent wishes in life is that people would read things before they commented on them on the internet. But mostly, I just wish I had known all this as a kid. Because apparently, instead of being a fat academic achiever, I could have instead deprived my body and brain of the nutrients I needed to function — and then I could have been Albert-freaking-Einstein. By extrapolation: starving children would receive the greatest attention, earn the highest grades and be the most energetic-right? That’s it! We stop feeding the children. Or, people could actually read and think some before responding to an article. I was always one of the fat kids. And despite the diets my mother made me do that I “failed” at, I still managed to graduate third in my class. They can’t say that poor kids do badly because they are hungry in one breath and follow it with but fat kids do badly because they eat too much in another. And what about the poor fat kids, who eat too much AND are hungry? Oh, yeah, they don’t exist. I’ll just say, I think I did better in school because I was fat–I was trying to overcompensate. Because I couldn’t be “pretty” (because I was fat), at least I could be smart. But I think we should stop making assumptions about children–about anyone!–because of the way they/we look. When I was 7 or 8 years old I wanted to do gymnastics. I loved it and would prance around the living room every time gymnastics came on the television. My mom, God bless her, saw my enthusiasm didn’t diminish and found a local studio that taught gymnastics. Even though we were poor my mom saved for many months to be able to afford the class. When she finally scraped and saved the enrollment fee, we drove to the studio – I was so happy the whole way, I couldn’t sit still. It took all of a 2-3 minute conversation once we got there before my mom was hauling me out of there and back into the car. The guy who taught the class told my mom that I couldn’t join – that he’d only let me in if I lost weight. My mom, who hardly ever cursed, cussed the whole way home. She was so hurt and angry and was trying to hide the tears from me that kept welling up in her eyes. I think I was more confused than anything. It was the first time I had ever heard the words “too fat” directed at me from a stranger and didn’t understand why I couldn’t join. I had saw all the other girls in the class, tumbling, prancing, balancing on the beams, it was AWESOME and I wanted to be a part of it. I just didn’t get why they were allowed to participate and I wasn’t. And exercise is touted as a weightloss aid. Shame he didn’t let you in. I was in gymnastics too as a kid, I don’t know why I stopped going. Yeah, that was the time everything changed for me. It was the only place in town that taught gymanstics so I never got to learn, as I was never able to lose enough weight to be allowed in. I was determined to lose weight so I could get in, so I started learning how to count calories and restrict. But the more I tried to manipulate my body size the more it started doing what I didn’t want it to do and started weight cycling. I never lost enough to get into that class. But I spent the next 20 years struggle with my body, weight, food, and eating disorders. I sometimes wonder what would have happened if I had been allowed to join. It pisses me off that kids today have it even worse when it comes to fatphobia and weight bigotry. As bad as society was toward chubby kids when I was a kid – today it’s 100 times worse. That scares the hell out of me and makes me realize how very badly things need to change, for their sake as well as ours. Logic fail. Also, typical bigotry. Anyone who is being routinely bullied is likely to be doing worse in school than someone who is not receiving such pressure. This is one of those abra-ca-duh things, but somehow these geniuses manage to miss the point, like always. The whole thing is weird to me. Fat kids, nerdy kids, kids who don’t fit in with the ‘popular’ kids often do extremely well academically because they pour all their time into the academics since they don’t often get invited to as many parties, or get to do the extra curriculars as a lot of other people have noted when they tried to join athletic teams, etc. I was one of those fat kids plus I lived further away from school so was even more isolated. I did great in school. I think I was lucky by some of these remarks, I was in a private school and had no teacher bias exhibited towards me. It was a religious school, maybe they were more sensitive about people? I don’t know, but I do know that all my friends were geeks/nerds/fat etc. and we were the braniacs. At least we had that. Actually, the prize for the most ridiculous comment goes to Dr Yaakov Wise, or Huddersfield UK. I’m just going to leave it there. Words fail me.